Bruce Springsteen and the E-Street Band played a new concert for The River Tour. Next stop of The River Tour 2016 is in Newark on Sunday. The latter concert at the Madison Square Garden has been performed on January 27th as per schedule. The show that should have been the former has been postponed to March 28th 2016 (check the page The River Tour 2016). Bruce Springsteen and the E-Street Band played 32 songs in 3 hours and 7 minutes. The second concert of The River Tour took place in Chicago. In honor of Glenn Frey, who passed away on January 18th 2016, Bruce Springsteen and the E-Street Band played Eagles’ son Take it easy. 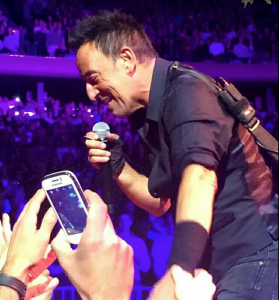 Last night Bruce Springsteen played in Pittsburgh the first show of The River Tour. Quite long show with 34 songs played in 3 hours and 24 minutes. The River full album has been played as per program. Rebel Rebel, in honor of David Bowie, kicks off the encores.